TOOELE VALLEY, UTAH (October 25, 2012) — The new Ford Racing F-150 SVT Raptor Assault program, based at Miller Motorsports Park, has announced its full schedule for the 2013 season. The Ford Racing Raptor Assault program provides hands-on experience in high-performance off-road driving on a variety of terrain at the state-of-the-art facility just outside Salt Lake City. A product of the Miller Performance Schools, the Raptor Assault uses slightly modified versions of Ford’s renowned production F-150 SVT Raptor. 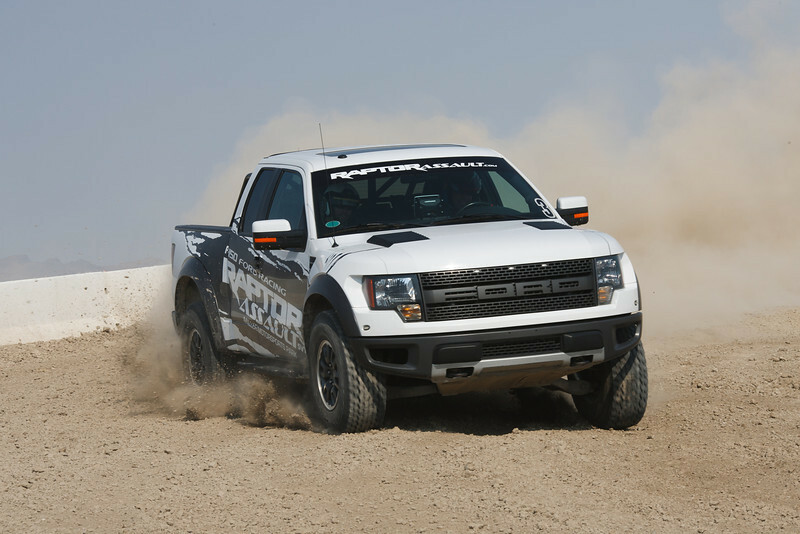 Miller Motorsports Park has three distinct off-road facilities that perfectly demonstrate the Raptor’s capabilities. There is an eight-acre Rock-Crawling Course, a 22-acre high-speed Off-Road Short Course and a 900-acre Off-Road Desert Course. Few, if any, other motorsports facilities in North America offer such a variety of terrain. The Raptor Assault One-Day School begins with a classroom session and vehicle orientation. Then you’ll get behind the wheel to take on eight acres of gravity-defying, white-knuckle rock crawling. Next, you’ll learn to read and deal with different terrain on our high-flying Off-Road Short Course. After a fully-catered lunch you’ll strap back into the driver’s seat to push your off-road driving skills to the limit on the Miller Motorsports Park Off-Road Desert Course – 900 acres of wide-open, dirt-churning desert terrain. After you’re finished driving and have received the checkered flag, your adrenaline rush still isn’t over. You’ll climb into the passenger seat for an incredibly thrilling ride along with a professional driver at the controls – it’s an experience you’ll never forget! Raptor Assault Hot Laps: Call for availability. For more information on the Ford Racing F-150 SVT Raptor Assault program, visit www.RaptorAssault.com. For more information on Miller Motorsports Park and the Miller Performance Schools, call 435-27SPEED (277-7333) or visitwww.MillerMotorsportsPark.com.